Set with a brilliant, round cut diamonds with a oval shape halo and diamond set shoulders, this beautiful polished 18ct White Gold ring totals 0.50cts and is certain to be treasured. Celebrate your engagement with a one-of-a-kind ring from The Diamond Story, Certificated by GSI. 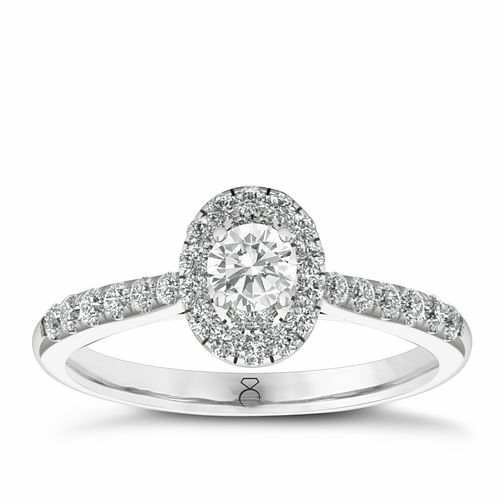 The Diamond Story 18ct White Gold 0.50ct Diamond Oval Ring is rated 5.0 out of 5 by 1. Rated 5 out of 5 by Anonymous from Stunning A truly beautiful ring that is bright and sparkly in all lights. The central diamond is stunning and the design is very pretty. I love the tapered diamond shoulders that add an elegant style to this beautiful diamond ring. I can’t stop looking at it ... i love it!